PRINCE’s Paisley Park New Special Tour Experiences Including Dance Parties, Dining & Movies Starting Dec. 1st! Online Merch Store Now Open! 10 Nov PRINCE’s Paisley Park New Special Tour Experiences Including Dance Parties, Dining & Movies Starting Dec. 1st! Online Merch Store Now Open! We just received this press release re NEW tours for Paisley Park & so much more! CHANHASSEN, Minn. (November 10, 2016) – Prince’s Paisley Park in Chanhassen, Minnesota has announced that it is expanding and enhancing its tour of the legendary production complex by offering new, themed fan experience packages, starting December 1st, in addition to the current General Admission and VIP tours. Tickets are now available for General Admission and VIP tours through March 31, 2017, in addition to these new themed experiences, while availability lasts. Visit the enhanced Paisley Park website, OfficialPaisleyPark.com, which launched today. 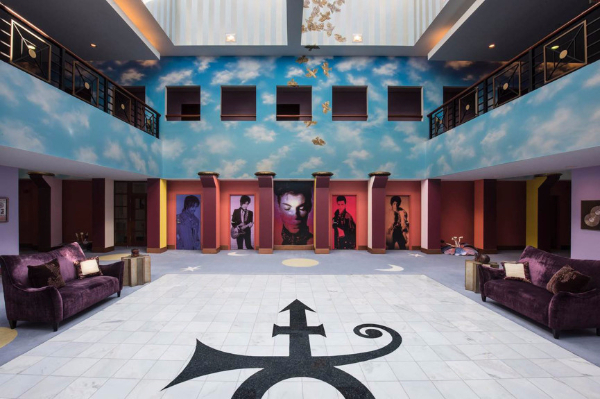 These new, themed tour options will offer Prince fans and visitors from around the world an even more in-depth, fully-dimensional Paisley Park experience with dance parties, dining experiences, recording opportunities, concert films and movies – evoking the activities and special events that Prince would often host at Paisley and bring to his fans. – On Thursdays, all day, starting December 1, VIP tour ticket holders will have the unprecedented opportunity to record live vocals over a short segment of a Prince song in the legendary Studio B control room – the same studio where Prince recorded countless hits, including songs from Sign O’ The Times, Graffiti Bridge and Emancipation. VIP tour ticket holders who record in Studio B will be able to take the live mix home with them on USB. – On Friday and Saturday evenings starting on December 2 and 3, from 6PM on, guests will be welcomed into the “Paisley Park After Dark” experience, in the tradition of the celebrated Paisley Park After Dark events hosted by Prince through the years. Friday evenings will offer fans a dance party with a DJ in Prince’s private NPG Music Club, in addition to the Paisley Park tour. Saturday evenings will be Movie Night, featuring Prince movies and exclusive, rare performance footage – including video segments never before seen – playing in the Paisley Park Soundstage at 9PM, with different movies and videos shown each week, in addition to the Paisley Park tour. On each Friday and Saturday evening, special dining selections will be available for purchase at the Paisley Park kitchen. – On Sundays, all day, starting December 4, the “Brunch Experience” VIP tour package will include a special meal in the NPG Music Club, featuring Prince music, videos and many of his favorite foods. “When U come to our house, next time we see each other, it’s gonna be at Paisley Park. And if U don’t know the way, get somebody 2 show you. Visit OfficialPaisleyPark.com for pricing info and details on these special packages and to purchase tickets. Today also marks the launch of Paisley Park’s official online merchandising storefront. The shop – hosted at OfficialPaisleyPark.com – now offers a full line of exclusive Paisley Park merchandise, including unique clothing apparel and accessories. Fans are invited to visit the shop today and sign up for the Paisley Park email newsletter for exclusive pre-sale and new product announcements. Shipping is currently set up for orders to Canada, the USA and Mexico. International shipping for fans outside North America will be available very shortly.